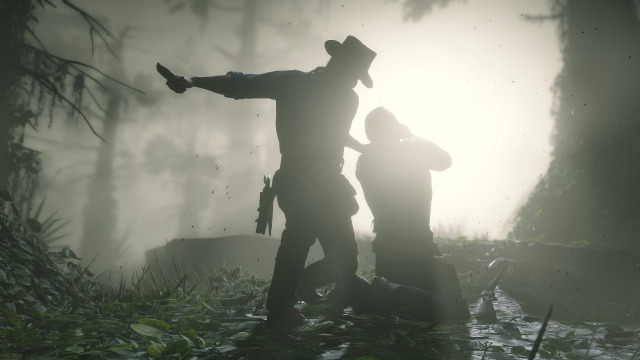 Not posting spoilers here but IGN, Gamespot, and others are releasing extended previews of Red Dead Redemption 2's story involving the first few hours. They basically go through a couple missions and spend the rest of the time messing around with different things so it can be a little frustrating trying to filter out story stuff from regular gameplay. Long story short: The game is deep. The game is detailed. The game is beautiful. There is plenty to see and do. Nothing earth-shattering at this point but it's good to hear. There are also new screenshots you can find in the gallery here. Are Armadillo and New Austin in the game? Yup! Upon inquiring with Rockstar I was told that the full map of Red Dead Redemption is also in this game, but that of course many more areas have been added. In the six hours that I played, I crossed only a small part of Blackwater and even that was gigantic. I did not meet those places because even six hours was not enough to see enough. There are a number of gamers who, by the way, find that worrying, and that is understandable. Unlike GTA V you have no helicopters, airplanes, jet fighters or fast cars and motorbikes. Your horse is your main means of transport. After visiting a larger city in the game, the lively, industrial Saint-Denis, I thought it was an intriguing idea to ride the whole piece back to my camp near the livestock city Valentine (I came by train). And that whole piece of driving took a long time, very long. Fortunately, you do not have to worry that you will waste a lot of time riding, because there is indeed fast travel in Red Dead Redemption 2 (you unlock after a while) and you can also use trains to get from A to B quickly. coming, similar to the taxi rides in GTA. You will then see a short animation and be fast where you have to be. By switching to different stations you can quickly transfer the entire card. Although Rockstar could not be concrete about how fast travel will be applied, it is suspected that you can use it between the different camps that you start in different areas during the story. So it looks like Blackwater isn't the only old location we'll see again. Rockstar had previously mentioned New Austin when describing the train from the Red Dead Redemption 2 collectibles but it wasn't a direct "yes it is in the game" statement. But the latest gameplay trailer briefly showed us a western frontier town that turned out to be the eastern end of Armadillo. Now we have something of weight for the rest of the old map including Mexico - assuming it isn't a lie, but we have no reason to doubt right now.